Our Sydney Aluminium sliding windows are among the most popular and classic window design options for modern commercial architectural styles. They perfectly suit both traditional and contemporary commercial designs in Australia. Their versatile design and configuration alongside great features deliver exceptional results in commercial and corporate construction projects. We can customise our Sydney designed aluminium sliding windows to match your requirements. Whether you need small windows with slim frames for unobtrusive views or windows with heavy glass glazing, we have the best solutions for you. Aluminium sliding windows are an ideal option if you require good airflow and light infill in your commercial premises. Our sliding windows have two stainless steel wheels at the bottom rails, with each having the potential to support up to 50kg weight. Due to few moving parts, they are easy to operate and require low maintenance. They come with beautifully designed white or black pearl window locks with keys for maximum security. They are also equipped with weather strips around the frames to stop dust, bugs and water intrusion. • A wide range of glazing options- single or double-glazing bars. • Available in different window styles configurations, colours and customised choices. • Elegant modern lines that give a stylish and contemporary finish to your business. • Integrated aluminium fly screens. 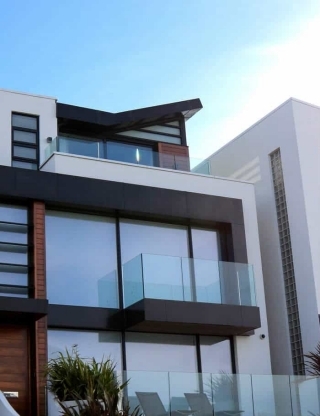 Our premium aluminium sliding windows in Sydney present great advantages in security, durability, strength, lightness, low maintenance, and affordability. As such, these high-quality sliding windows offer efficient solutions to the high-end commercial and corporate market. Get in touch with us and realize why our commercial aluminium sliding windows are the ideal choice for your commercial building , shop or business.